Fear tells us that school shootings have become the new normal. I say don’t believe fear. After the most recent shooting in Santa Fe, Texas I almost didn’t know what to say. By now, we are all aware of the horrendous number of school shootings in the USA. To date, there have been sixteen school shootings in five short months of 2018. The statistics are astounding. However, the statistics of people living in fear are much higher. Mayhem and pandemonium everywhere as parents, students, faculty, authorities, and the world as we see it is up in arms without real answers and remain living in fear. With much love and compassion, I encourage everyone to stop fear in its tracks and with that, show you how to stop fear from running your life. As an author I travel the world when I can, to specifically observe and research different cultures and topics. What I found is that although high security and even militant actions may seemingly instill safety in people, it does not. No matter what gun laws and measures of security are put in place unconscious people find a way to act out their own fears. In El Salvador the military partner with the police in enforcing high security throughout their country. When you enter a convenience store there are military soldiers standing guard with rifles. And yet, the Salvadorians cannot live in peace in their own homes because the MS-13 have taken over the villages, and even get into the schools threatening young students to join their gang or face death and that of their whole family. This is a serious problem. Even the highest measures of security have not stopped fear from running their lives. 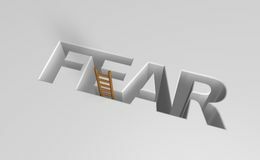 I will give you three practical ways to stop fear from running your life and your children’s lives. This practical process begins with each individual and then collectively we can live with peace as a global family no matter what the life situation. See the power source of love as the highest energetic force in existence. Understand that fear has nothing on love. Love is the reigning force and has the power to rise above and overcome everything. Remember, love is absolute and fear is an illusion. Stop fearing something that hasn’t happened because of what already has. Start fixing your heart and mind on love and affirm love and peace within the walls of your Self and within the world in form around you. Don’t allow the illusions of fear to run your life or your children’s lives. When weighing out the negative and positive things in the world as you see it at this moment, tip the scale with the positive events in the world and not the negative ones. Put all of those positive and loving events on the scale and tip over. There is more good than bad in the world. If you don’t believe this to be true then I encourage you to examine the inner dialogue of the mind. Stop buying into the bad news media, and start placing your attention on the good news. You may need to rewire your thinking but it is well worth the price for living in peace. It is time to tip the scale as an individual, a nation, and a planet. Don’t lower the standard of your energy. Instead, raise the bar. Heighten the vibration on earth by radiating your highest vibration out there, instructing the world in form to reflect it back to you. Allow the world to match your loving light energy to yours. Not the other way around. The way we raise the bar is by reversing the current flow of energy. Reverse the flow of energy by letting your highest vibrational energy dominate all situations. Remember, love is the reigning force. When we raise the bar no matter what life situations we experience, we will be able to rise above it. The guiding force must be love. Love is the first gateway to triumph, and this body is a vehicle that needs to be driven by the love. As parents, students, faculties, authorities and the human race as a whole, none of us desire to live in fear. And yet, the very things we fear are what stops us from living in peace. The time is now to change that. Take the three practical ways to stop fear from running your life into your daily practice. Let’s use the power source of love, tip the scale, and raise the bar together. Lily Sanders is a noted Author, Speaker, Co-host, and Coach, recently awarded one of the 15 Top Coaching Experts in NYC. Her newly released book “Truth to Triumph” is a spiritual guide to finding your truth. Lily’s passion is for humanity and thrives on helping others live life at a deeper level. Download her FREE eBook “Soul Bread” and benefit from daily affirmations that feed the soul. Follow Lily on FB, YouTube, Twitter, and Instagram.